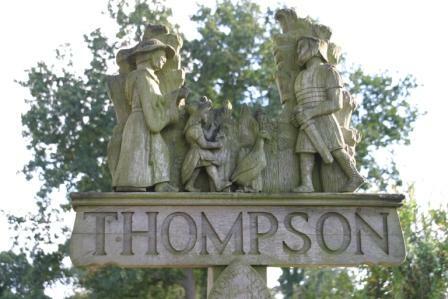 It was a bright, crisp, Sunday morning and Thompson’s Millennium Green was buzzing with adults, kids and dogs. Forty young English Lime trees were standing by, ready to be planted along either side of the central path. Celebration Avenue, a project organised by the Millennium Green Committee, was enthusiastically embraced by the whole village. Trees with a personalised memorial plaque were available to purchase as a dedication to a loved one. All forty trees were purchased by locals and they represent love for special people, young and old, alive and no longer with us. Many people were on-hand to dig holes, hammer in stakes, secure ties and cement in the wooden plaques. The trees were planted in accordance with a plan produced by James Haddingham, giving them perfect spacing that will stand the test of growing time. Lime or Tilia, found throughout Europe is a popular choice for avenue planting. Its tiny flowers in spring have an exquisite fragrance, which perfumes the air. The flowers are also a firm favourite with honey bees, which will be pleasing for the beekeepers in the village. Alongside the planting of Celebration Avenue there was another tree-related activity. The well-known, local, chain-saw carver, Tim Atkins, began his commission to create a Bookworm inspired wood sculpture from beech and oak. This creation will incorporate an adventure for the young and a resting opportunity for the young at heart. 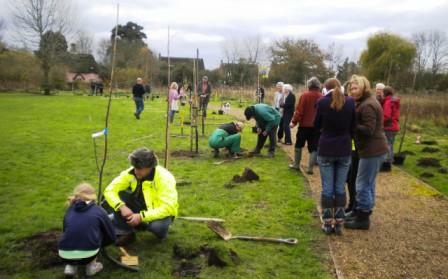 This event was organised by the Millennium Green committee and special thanks goes to John Scott who sourced and procured the Lime trees from Dells nursery near Fakenham. Henry working so enthusiastically that his equipment gave in on him. Thanks to Ann Scott for capturing this wonderful moment.